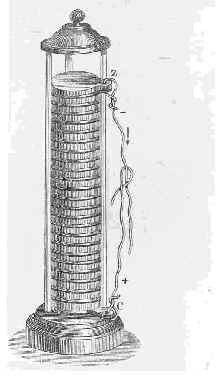 In 1799, Alessandro Volta developed the first electrical battery. This battery, known as the Voltaic Cell, consisted of two plates of different metals immersed in a chemical solution. Volta's development of the first continuous and reproducible source of electrical current was an important step in the study of electromagnetism and in the development of electrical equipment. Alessandro Volta (1745-1827), professor of philosophy at Pavia (1774-1804), contributed much to electrical science. He introduced the theory of electrical current and observed electricity separating water into its component parts of hydrogen and oxygen. Before Volta, it was assumed that electricity was generated by living beings (animal electricity). He discovered that electricity could be generated chemically and made to flow evenly through a conductor in a closed circuit. He built a battery, known as a Voltaic pile, made of alternating copper and zinc discs, with each pair of metals separated by flannel soaked in weak acid. Such was his fame that in 1801 he was summoned to Paris by Napoleon who had a special medal struck in Volta's honor. The world has honored Volta by naming the unit of electric potential - the volt - after him. The Voltaic pile stimulated so much scientific inquiry that, by 1831, when Faraday built the first dynamo, the basic principles of electricity had been established. The Milestone plaques may be viewed at the Tempio Voltiano, which is a museum in Como, Italy devoted to Volta's achievements, and at Volta's room at Pavia University, Pavia, Italy. This page was last edited on 26 January 2016, at 14:54.